Eagle Scout Court of Honor – The Ultimate Scouting Achievement! Recently our troop honored two of our senior scouts, Thomas D. and Joshua W., in the most special ceremony of all for Boy Scouts, an Eagle Court of Honor. Widely regarded as the pinnacle of achievement in Boy Scouting, the Eagle Court of Honor takes on an extra special meaning compared to our other regularly scheduled Court of Honors. The Boy Scouts of America estimates that only 5% of all Boy Scouts ever attain the level of Eagle Scout, with only 1.7 million Eagle Scouts cumulatively in our country since Boy Scouting began here in 1912. It is indeed an exclusive club and an achievement that signals to the community and the business world that an individual subscribes to the highest level of integrity and performance. As I often mention in my Scoutmaster’s Conference for Eagle Scouts, the attainment of this coveted rank will become increasingly more important to the individual scout over time. An Eagle Scout unquestionably has met a higher level of standard and has clearly set himself apart from his peers as someone being very special! In our part of the country, we are blessed with several local dignataries & politicians that display a genuine interest in Eagle Scouts, as these young men are viewed as future leaders of our community. As part of our Court of Honor, these local dignataries often provide the Eagle Scouts with special Proclamations mounted in picture frames. As well, one of our senior troop committee members, Mike W., provides the Eagle Scouts with a customized scrapbook of impressive letters of congratulations from several of the most important government leaders in our country, including the President of the United States, the Vice-President of the United States, and nearly all of the President’s cabinet members. Our troop tries to make the Eagle Court of Honor a very family-oriented event given that so many family members are in attendance. 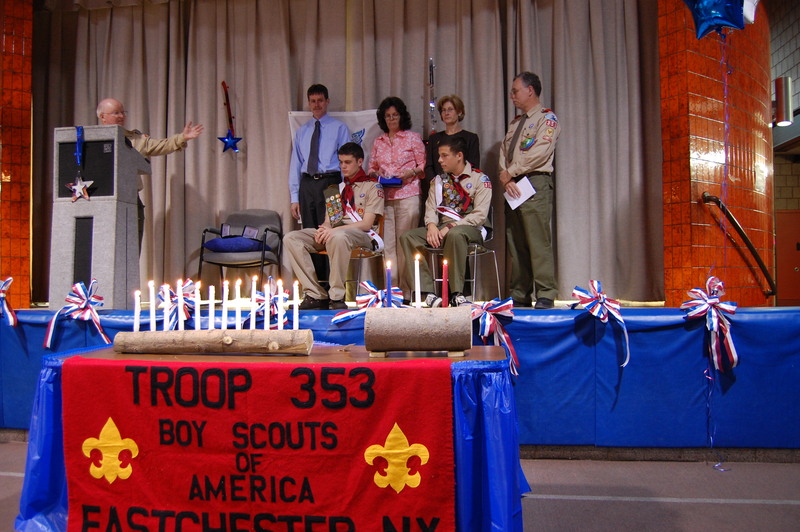 After the ceremony, considerable food and refreshments are enjoyed by all, while scouts comb through the special scrapbooks of congratulatory letters. Troop 353 is relatively young, less than 20 years old, and has been blessed with an average of one Eagle Scout for each year the troop has been in existence. For a complete list of our troop’s Eagle Scouts, click on the “Eagles Nest” tab at the top of the page. Perhaps more importantly, several of our Eagle Scouts still remain active in our troop’s various activities. For more great photos from that special night, please click here. Author scoutmasterPosted on July 8, 2007 April 22, 2009 Categories Activities, Advancement, Events, Merit Badges, Photos, Troop Meeting1 Comment on Eagle Scout Court of Honor – The Ultimate Scouting Achievement!